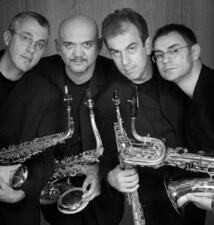 The graduates of the University of Zagreb Music Academy (Croatia) in the class of Prof. Josip Nochta founded the Zagreb Saxophone Quartet, which has been performing with the present members since 1989. The Zagreb Saxophone Quartet are: Dragan Sremec, saxophone professor and vice dean at University of Zagreb Music Academy – soprano saxophone, Goran Merčep, chamber music professor at University of Zagreb Music Academy – alto saxophone, Saša Nestorović, chamber music professor at University of Zagreb Music Academy and director of HRT Big Band – tenor saxophone, and Matjaž Drevenšek, saxophone professor at University of Ljubljana Music Academy (Slovenia) – baritone saxophone. ZSQ has performed in Albania, Argentina, Austria, Belgium, Bosnia and Herzegovina, Canada, Chile, Croatia, Denmark, France, Germany, Greece, Hong Kong, Italy, Latvia, Macedonia, Monaco, Montenegro, Russia, Serbia, Slovenia, Spain, Switzerland, Turkey, UK, and the USA (Arizona, California – Los Angeles, Connecticut, Georgia, Illinois – Chicago, Indiana, Iowa, Louisiana, Massachusetts, Michigan, Minnesota – Minneapolis, Nebraska, New York, New York City, North Carolina, North Dakota, Ohio, Pennsylvania, Texas, Utah, Washington DC., Wisconsin, Wyoming). They have been soloists with orchestras in Croatia, Slovenia, France, USA, and Hong Kong, and performed at festivals in Berlin, Dubrovnik, Ljubljana, Munich, Novi Sad, Ohrid, Orsay, Paris, Podgorica, Riga, Split, Zagreb; also at WSCs in Pesaro, Valencia, Montreal, Minneapolis, and Ljubljana. Numerous Croatian as well as foreign composers dedicated more than 50 pieces to them. Quartet has recorded for the HRT, ÖRF, RTL, RTV Slovenia, Radio France, Radio Spain, WDR, and released 15 CDs (in Croatia, Slovenia, and USA), which have won seven Croatian discography awards "Porin".